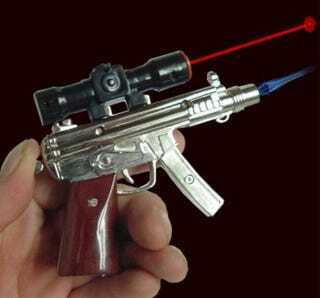 You should really add a little pizazz to your next board meeting with this mini laser-sighted machine gun flame thrower. We know, the premise sounds ridiculous. Who would ever really give a business presentation with the Mini Laser-Sighted Machine Gun Flamethrower? Let us paint a picture for you. You work in the sales department for a successful steel company, and you're slated to speak at the big investor board meeting (a great opportunity for your career). But there's one catch: you'll be following Rick Sellerman, the slickest guy in the department. Rick gives a knock-out presentation complete with animated Powerpoint slides. The board laughs, cries and even lines up one by one afterward just to shake his hand and thank him for working at the company. Then it's your turn. You pull out the old trusty poster board, complete with a title that slants halfway down the page since you refused to use a ruler. You show the board some sales figures alright, the best numbers they've seen in 10 years. Then you aim the laser sight, pull the trigger and unleash hellfire all over those numbers. Good is no longer good enough, you tell the board. We need to do better.